This paper analyzes the potential effects of the Trans-Pacific Partnership (TPP), the Trans-Atlantic Trade, Investment Partnership (TTIP) and also tariff-related measures implemented by Trump administration against China’s export. It examines the sectors in which China will be affected most in terms of its competitiveness in the US market against the countries included in these agreements. It also investigates whether China has significant price advantages in certain sectors and whether these agreements and tariff measures have the potential to erode those advantages. The ‘quantity’ and ‘value’ of US imports from the countries included in these agreements are used for calculating ‘quantity similarity indexes’ and ‘price similarity indexes’ in order to compare China to its competitors. Taking into account ‘product heterogeneity’, this paper reveals how Chinese exports will be affected by the elimination of tariff barriers within the context of these agreements and also by the increases in tariffs on Chinese products. The paper also presents policy implications for China to create its own trade and competition measures against these possible trade actions, along with the potential effects of Chinese competition on other countries in the US market. The results indicate that China is likely to be seriously and negatively affected from these prospective agreements and tariff measures. It is also likely that China will lose its price competitiveness against its main competitors in the US market, especially in such sectors as plastics, medical appliances and optical instruments. Last but not the least, the products whose tariffs are increased by the Trump administration are selected in a rational way from the viewpoint of the US, as those products are generally the ones in which TPP and TTIP are relatively ineffective. All published articles are licensed under Creative Commons Attribution-NonCommercial-NoDerivs 4.0 Licence. Please visit Copyright Page for details. Caetano, J., Galego, A., Vaz, E., Vieira, C., & Vieira, I. (2002). The Eastward Enlargement of the Eurozone: Trade and FDI (Ezoneplus Working Paper 7 No. 7). Free University Berlin, Jean Monnet Centre of Excellence. 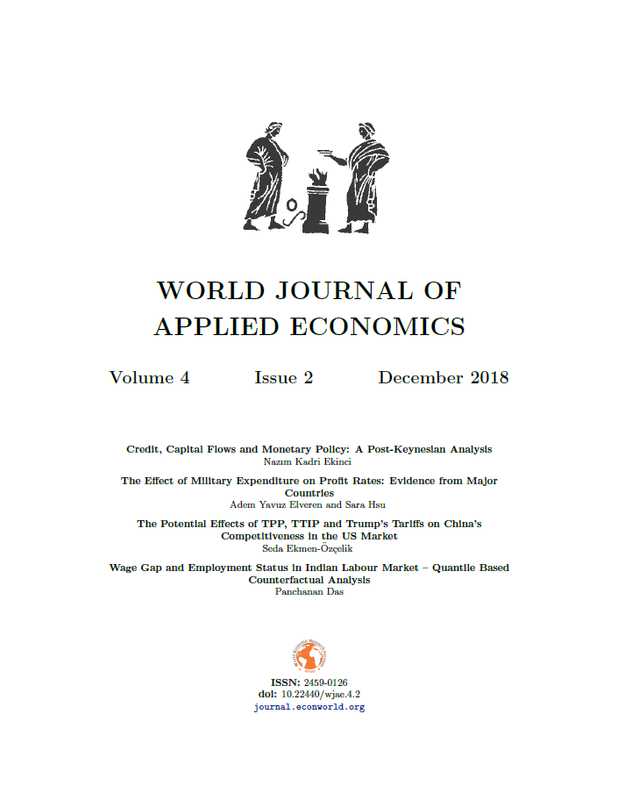 https://EconPapers.repec.org/RePEc:ezo:ezppap:wp07. Chandra, P. (2016). Impact of Temporary Trade Barriers: Evidence from China. China Economic Review, 38 , 24-48. http://dx.doi.org/10.1016/j.chieco.2015.11.002 . Changing Patterns of Global Trade (Strategy, Policy, and Review Department). (2011). International Monetary Fund. https://www.imf.org/external/np/pp/eng/2011/061511.pdf. CNN. (2018). Donald Trump Lays Out Tari Plans for Chinese Industrial Goods. https://money.cnn.com/2018/03/08/news/economy/tpp-trump-tariffs/index. html?iid=EL. Erlat, G., & Ekmen, S. (2009). Export similarity and competitiveness: The case of Turkey in the EU market [Proceedings of Anadolu International Conference in Economics]. Financial Times. (2018). Donald Trump Lays Out Tari Plans for Chinese Industrial Goods. https://www.ft.com/content/42fb1100-378f-11e8-8eee-e06bde01c544. Hallward-Driemeier, M., & Nayyar, G. (2017). Trouble in the Making? : The Futureof Manufacturing-Led Development (Ezoneplus Working Paper 7). World Bank. https://openknowledge.worldbank.org/handle/10986/27946. Li, C., Wang, J., & Whalley, J. (2014). China and Global Mega Trade Deals (Papers No. 34). Centre for International Governance (CIGI). https://www.cigionline.org/publications/china-and-global-mega-trade-deals. Loke, W. H. (2009). East asia and southeast asia: Similarity in trade structures [The Singapore Economic Review Conference (SERC)]. Schott, P. K. (2006). The Relative Revealed Competitiveness of China's Exports to the United States vis-a-vis Other Countries in Asia, the Caribbean in Asia, the Caribbean, Latin America, and the OECD (Working Paper No. 39). Inter-American Development Bank, INTAL. http://idbdocs.iadb.org/WSDocs/getDocument.aspx?DOCNUM=35318883. Tentori, D., & Zandonini, M. (2014). The Future of the Transatlantic Economic Relationship: Opportunities and Challenges towards the TTIP (Working Paper No. 35). Transworld. http://transworld.iai.it/?p=1547. Wasinski, M., & Wnukowski, D. (2017). Consequences of the U.S. Withdrawal from the Transpacic Partnership. Strategic File, 35 (3), 1-6. Xu, X., & Song, L. (2000). Export similarity and the pattern of east asian development. In P. J. Lloyd & X. Zhang (Eds. ), China in the global economy (p. 145-164). Edward Elgar. Yunxia, Y. (2009). China & Mexico: Comparison of Trade Competitiveness [Mimeo]. http://ilas.cass.cn/webpic/web/ilas/manager/jeditor/UploadFile/2009169347673.pdf. Zhiyu, S. (2003). Export Similarity and Trade Competition: A Comparative Study on China and ASEAN Countries. Finance & Trade Economics(9), 53-58.